A portable steel weighbridge measuring 9m was recently commissioned by South Australia’s Collinsville Stud. 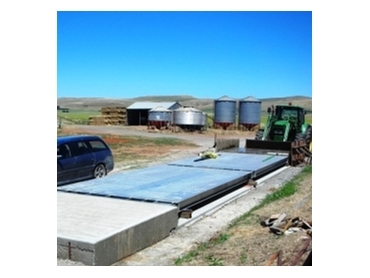 Supplied by the Adelaide branch of Accuweigh , the portable weighbridge is used to weigh trucks delivering animal feed to the company’s lamb feedlot. The portable steel weighbridge uses fully galvanised steel sections that are bolted together for easy on-site assembly. The low weight of the assembled weighbridge deck along with a low deck height offers further savings by minimising the civil requirements of the weighbridge foundations. This portable steel deck weighbridge offers exceptional strength and durability. The centre block assemblies containing the load cells are also used to join the weighbridge sections together. This design positions the weighbridge joins at the strongest loading points of the weighbridge and minimises deflection of the weighbridge decks under load without the need for expensive oversize structural beams. Installation resources of steel deck weighbridges can be significantly less than a concrete deck weighbridge and can usually be assembled in one working day with a small crane.